Apple has today unveiled the all-new MacBook, a new line of notebooks delivering the thinnest and lightest Macs on record. According to Cupertino, every component of the new MacBook has been “meticulously redesigned” to create a Mac that weighs 920 grams and is 13.1 mm thin. Featuring a12-inch Retina display that is the thinnest ever on a Mac, the device incorporates an Apple-designed full-size keyboard, the all-new Force Touch trackpad and a more compact USB-C port for data transfer, video out and charging in a single connector. Furthermore, improved battery design aims to maximise every millimetre of space to deliver all-day battery life which will be available in three aluminium finishes—gold, silver and space grey. “Apple has reinvented the notebook with the new MacBook, and at just 920 grams and 13.1 mm, it’s the thinnest and lightest Mac ever,” says Philip Schiller, Senior vice president of Worldwide Marketing, Apple. “Every component of the MacBook reveals a new innovation. 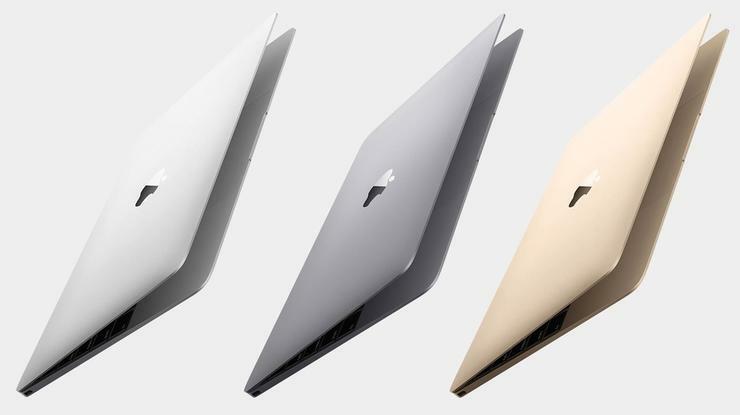 Measuring 13.1 mm at its thickest point, the new MacBook design is 24 percent thinner than the 11-inch MacBook Air. With a new precision-milled unibody enclosure featuring integrated Wi-Fi antennas and a top case with polished stainless steel Apple logo, MacBook is available in three elegant finishes—gold, silver and space grey—and is the first MacBook with an all-metal enclosure. Meanwhile the new keyboard is 34 percent thinner and uses an Apple-designed butterfly mechanism that is 40 percent thinner than a traditional keyboard scissor mechanism yet according to Apple, four times more stable. The new MacBook also features a 12-inch Retina display with a 16:10 aspect ratio, measuring 0.88 mm thin. With a larger aperture for each pixel, the new Retina display uses 30 percent less energy than existing Mac notebook Retina displays, alongside a resolution of 2304 x 1440 for text, photos and movies. MacBook also features the all-new Force Touch trackpad which features built-in force sensors that allow you to click anywhere while enabling a new gesture called Force Click, a click followed by a deeper press, for tasks like pulling up the definition of a word, quickly seeing a map or glancing at a preview of a file. According to Cupertino, the new MacBook has 35 percent more battery capacity than would be possible with traditional battery cells and delivers all-day battery life with up to 9 hours of wireless web browsing and up to 10 hours of iTunes movie playback. The all-new MacBook will begin shipping Friday, 10 April through the Apple Online Store and select Apple Authorised Resellers. MacBook comes with a 1.1 GHz dual-core Intel Core M processor with Turbo Boost speeds up to 2.4 GHz, 8GB of memory, 256GB of flash storage and Intel HD Graphics 5300 starting at recommended retail price NZ$1,999, and 8GB of memory and 512GB of flash storage for $2,399. INSIGHT: Can Apple Watch sell to salespeople?